I've been working at building up my inventory for the market season, and on my mental list of things to felt is: big birds, woodpeckers, owls. And I've been procrastinating. Don't ask me why, it wouldn't make any sense. Anyway, I started one last night, and immediately asked myself why I've been putting it off. I really enjoyed making him! 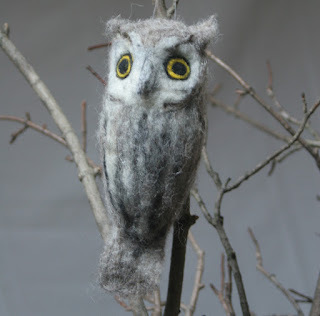 And I was amazed to find that the process was easier, more intuitive, and gave me better results than I had last year when I made owls. Practice really does make progress! I like the way this shot came out. Photography is not my forte, and it often surprises me like this shot did. I have no idea why it came out darker than all the others, but it fits for the owl; it looks like a night shot, with the moon shining on the owl's face. At least to me it does!